I arrived home at 5:30 PM and determined that TONIGHT would be the night! 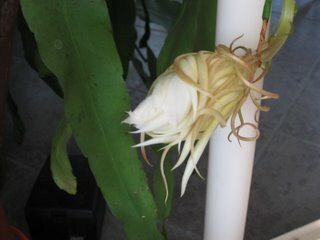 The night blooming cereus (Epiphyllum oxypetalum) chose this evening to bloom. I took pictures every half hour from 5:30 – 8:30 and didn’t notice much change each time. However, beginning at 9:00, as the sun began to dip low in the west, I saw a noticeable change as the flower began to really open. At that point, I decided to take a new picture every 15 minutes or so. I’ve put them in chronological order below so you can see that this flower really does open relatively quickly. The scent is strong. I would describe it as a bit heavy, like an old woman with way too much perfume, but to be polite, we won’t mention it to her! 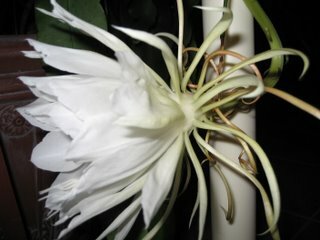 She is after all, the Queen of the Night, and has chosen, after 6 years of waiting, to re-bloom for me. And she only has this one night to attract her suitors for pollination. By morning her flower will be wilted. 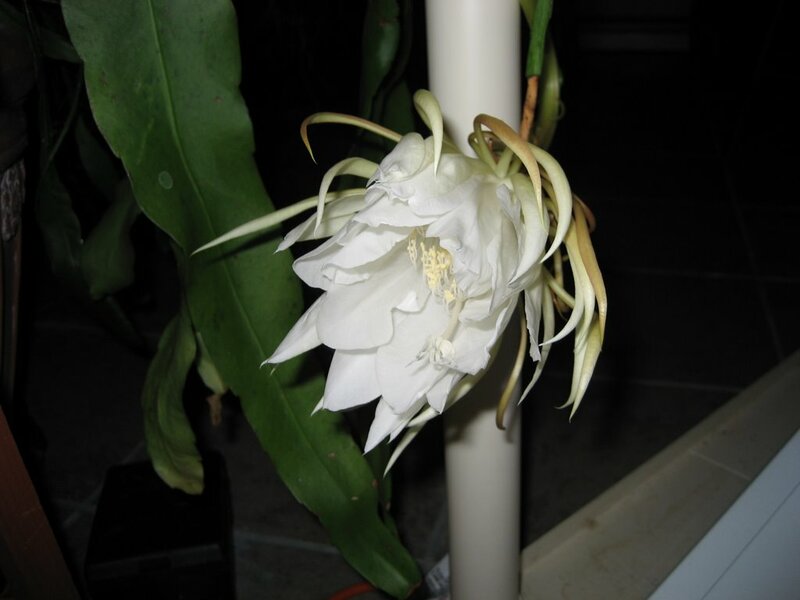 I know that there are people in Florida and other warm locations who keep their night-bloomers outside, and in that climate they are rewarded with dozens of blooms at once, and so in comparison, my one flower may be something they would not even notice. 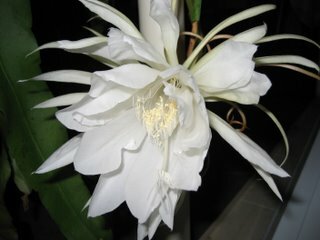 But my night bloomer lives year-round in my sunroom, so I welcome her one bloom any time it happens. 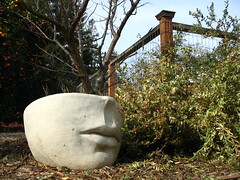 If you would like more info on the history of my particular plant, see this previous post. 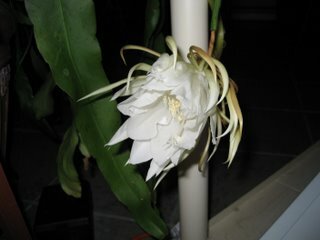 Without further comment, I present the Queen of the Night! I can almost smell the sweet aroma. Thank you for sharing the pictures--she is so beautiful!! That corner of your sunroom looks incomplete - no monkeys! 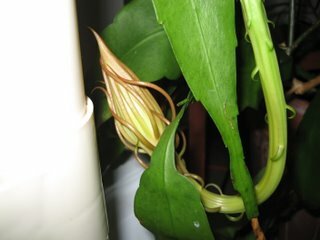 I wonder why this blooms only once in 6 years or so, and why the bud only lasts for one night? I wonder what the trigger is to stimulate it to bloom? Maybe there is a botanist somewhere someplace who has devoted their academic career to the study of this plant. At any rate, it is gorgeous! Thanks for sharing! Wow - that's a great set of photos... and a beautiful flower! I've never seen one of those. It must be very special to see it open, when it only comes out every 6 years or so. Wonderful photos. The flower looks so graceful and light. Lucky you to get to experience in first person. Thanks for letting us have a vicarious experience. So cool to see! And now I'm dying to smell one because of your vivid description. Actually, I think this plant took 6 years to bloom since the last time because I had to repot it 6 years ago and it just took that much time to get used to its new pot. I hope that from this point forward, it will bloom at least annually! Holy cow! It's a good thing you have a sunroom - I read that people used to bring them out for the summer, then back in when it got cold... can't imagine trying to transport that enormous plant twice a year. This beauty is worth a journal entry, for sure. I've always been fascinated with time-lapse photography ever since I saw the original "The Time Machine" as a child. What patience you have! both to take this set of photos and to wait six years for the next flower. I'm not very good with potted plants, myself. I doubt I could keep one alive six years. It kind of reminds me of some kind of orchid. Are they always white? When will it probably bloom again? It is very pretty. You could make a quilt with its' picture, or at least a pillow. I got my plant two yeas ago, as a stick. It only has ten leaves now, so I see it grows very slowly. I can't wait for my plant to bloom, as it looks like a very spectacular event. Nice pictures though, when mine blooms i'll take some too. I live in Sydney Australia and I took some pieces of plant that had been pruned and put them in a pot and watered them. It has not taken six years and I found a bud a couple of weeks ago but it did not seem to bloom properly and just looked all sad and soggy. 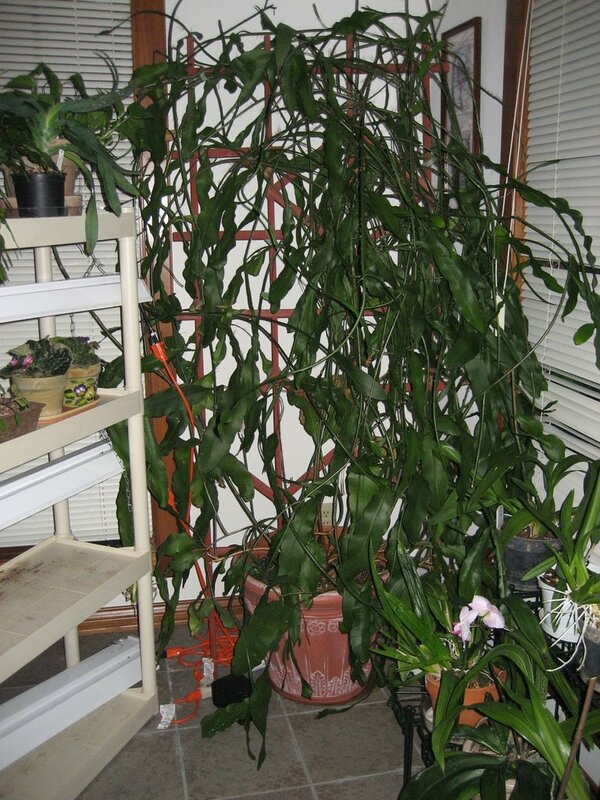 My next door neighbour had this problem too with her plant (which was where I obtained the cuttings). Reading your blog I am now beginning to think that I just missed the flowering at night as I was not aware that it only lasted one night. Next time I will know better and have a look at it late at night. I have a Google Alert for "Night Blooming Cereus" and was sent to your blog today to see your post about your cereus, which is certainly beautiful. 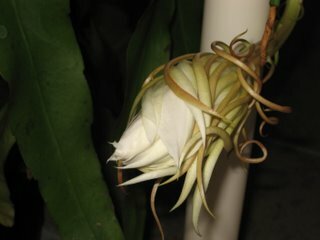 I'm sharing with you my little imovie about our cereus and a time lapse movie we made of one of the openings. Enjoy! What a luscious beauty! I'll have to take a look at that link... the tepals (or whatever) are really amazing. From what I've researched, it can bloom two to three times a year, but three is really rare. Most other plants bloom and stay bloomed because they're happy, but this is different. Epi Oxy blooms because it's scared. It blooms for survival when it's threatened. I've read one method is to change it's diet. In any case, don't trust me, look it up yourself. My parents had one of these when I was young. 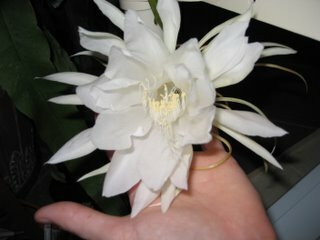 It was about a third of your size, but it had a dozen flowers at it's peak. I don't know why it's not living anymore, but I missed it and started growing my own. Hopefully I've helped you make yours bloom more often. 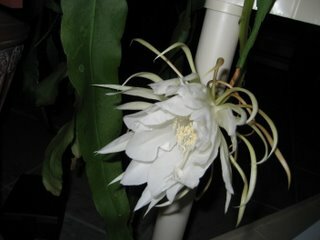 Wow, thanks for the great photos, I have one of these plants, also a passalong plant but mine has never bloomed. Beautiful! I had 4 blooms last night and this is the 3rd set of blooms I've had this summer. I have 2 more buds. They will probably bloom within the next few days. These flowers likes to be potbound, so don't repot it. Also, I read somewhere that they bloom only to survive, so if you have a healthy plant, they won't bloom. I have another Night Blooming with 15 buds on them right now, but these flowers are smaller, not the dinner plate size like the ones that bloomed last night. 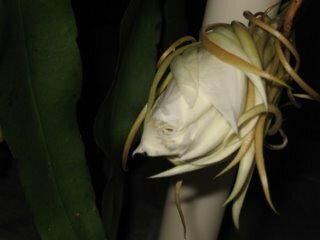 My mother-in-law also has the Queen of the Night plant. People believe that this is a good luck plant. If you are very fortunate in your life, your flower will bloom once or twice a year. Some people believe that once the flower is fully open, you can pick the flower and drink (put in a cup of water or wine. Can last a long time if bottle)or eat the next day when it dies. The flower is suppose to help your immune systems, low and high blood presure (suppose to help go back to normal). My mother-in-law and her friends and relatives drink from her Queen of the Night flower every year when it bloom. They say the flower help them a lot. They can't wait for the flower to bloom every year. If you have one you should try it. Some people charge money to sale the died flower for people to use. Fabulous! I was gifted this plant 4 years ago and never knew what it would be like, although I knew it was night bloomer. Now, with more time on my hands, I can take some time to dedicate to itso that it may bloom..Thanks for the beautiful pictures..WOW! 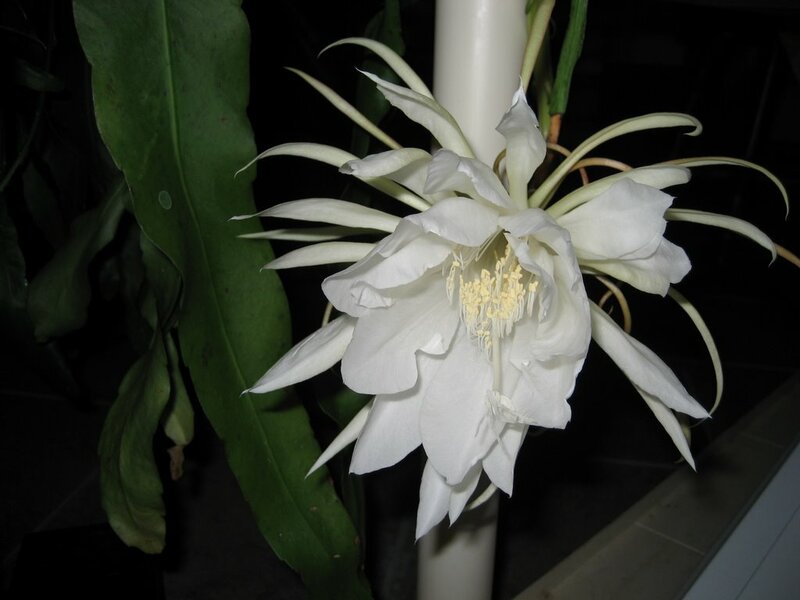 In tropical countries like India it blooms thrice a year (predominantly in May). I was one those luck once who had 45-50 bloom at once. It was a great sight. One the things I have noticed is that they don't like light when they bloom (its my opinion). I usually keep the light off. This is Night queen (Selenicereus grandiflorus) and there is Species called Queen of Night (Cestrum Noctrum) an equally beautiful plant. 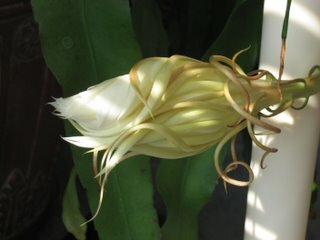 I have a queen of the night plant and it has given 12 buds and growing healthy, i think all of them will flower. is this something amazing or normal ?